VirtualReg Manager is a utility which creates virtual registry files and is also able to edit them through a regedit-like interface. It provides command line support for automation. Feel free to include this application in your freeware. Since it’s a .NET assembly, it works on every Windows platform. The main form (VirtualReg Manager) of this tool provides the visual interface to create a virtual registry. This can also be achieved through command line, as we’ll see later. One can decide whether to virtualize a key along with its subkeys or not. Numbers are stored in hex format, whereas all other data is base64 encoded. 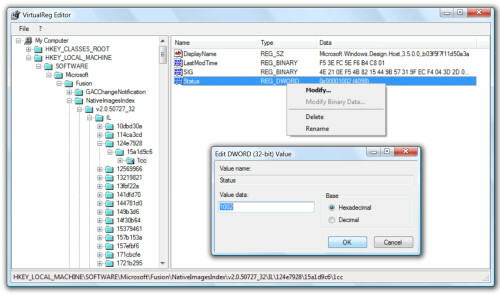 The virtual registry file can be edited with VirtualReg Editor (vregedit), which is very user-friendly as its interface is identical to regedit’s one. As you can see, it’s a simply ini file. If the “subkeys” parameter is missing, then subkeys are not virtualized.